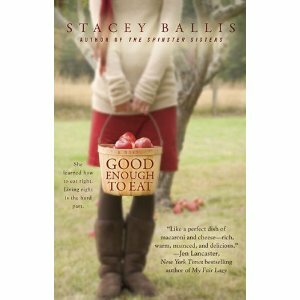 At the very beginning of Stacey Ballis's latest novel, Good Enough to Eat, the reader learns that main character Melanie Hoffman has recently lost half her body weight as well as her husband, who has left her for someone her former size. She has also spent the last year or so of her life leaving her law career to open a cafe devoted to healthy-but-tasty foods, the descriptions of which are why we've added this book to our "Foodie Book Friday" collection. Each chapter begins with the story of a comforting dish from Melanie's youth (think macaroni and cheese, fried chicken and chocolate chip cookies) that will tease your tastebuds and make your stomach growl. Throughout the book are glimpses of dinner parties, cafe offerings, and food-focused scenes that make the reader want to jump into the pages and dig in. Thankfully, at the end of the book are 40 pages' worth of recipes - most of them in the original and health-conscious versions to pay homage to Melanie's struggle to maintain her weight. So, after reading a particularly delicious description, a reader could actually whip up that exact dish. Food aside, this is a light-hearted but satisfying story. Melanie has taken many risks, and this book is about seeing how those risks transform her whole life. But mostly, this is a book about relationships, Melanie's support system as she traverses through those risks. Melanie is a wife, then an ex-wife, a sister, a friend, an employer, a roommate and a lover. There are healthy relationships and abusive relationships, heterosexual relationships and homosexual relationships, love relationships and even hate relationships. And all of these relationships are explored, quite literally, at the table, over food, a common denominator for us all. In Good Enough to Eat, Ballis has created real, authentic characters whom the reader can relate to, care about, and root for. Witty, contemporary, and sumptously written, this great story is one for foodies and non-foodies alike. Thanks for the recommendation. Do we ever tire of food-themed novels? Did you write this book review? If so, you might want to send it to a book company because it's great!